Best Cup of Coffee, Ever! A pinch of salt (and our well seasoned filter) make the best coffee, ever! There’s no need to go out and purchase a fancy machine to make a great cup of coffee. There’s also no need to go out and buy a specific type of coffee, or for that matter, to buy whole beans and grind them seconds before brewing your coffee. Let’s face it, there are hundreds of different types of coffee out on the market and everyone likes something different. We got over our coffee snobbery a long time ago. For us, it’s about what we think tastes good, costs the least amount of money, takes the least amount of time, and takes up as little counter space as possible. For those reasons we buy our beans in bulk at Costco, grind them at the store, fill a Mason jar with coffee and store it in the cabinet. The rest of the coffee goes into the freezer. We say, drink what you like, but to make a good cup of coffee even better, here’s a tip we think you should try: add a pinch of salt. That’s right, salt. Just a small amount is all you need to bring out the flavor of the coffee, less than an eighth of a teaspoon per pot. What does the salt do? 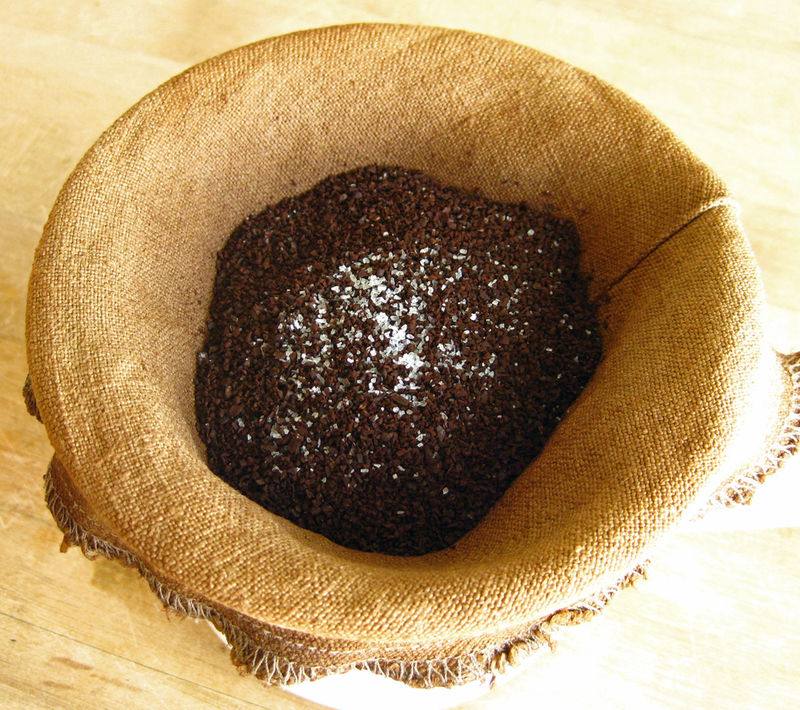 As in cooking, salt brings out the flavors of the coffee. It makes the coffee less bitter and mellows the notes. We read about it in Cook’s Illustrated, so it must be true. We’ve been hooked since the first try. How do we make our coffee? First off, we like the pour over method and we use a reusable hemp coffee filter (it’s kind of like a cast iron skillet, it just gets better with age). We decided we don’t need a stovetop kettle – we’ve ruined a few in our lives – so we just heat the water in a pan. Quick, easy and simple! 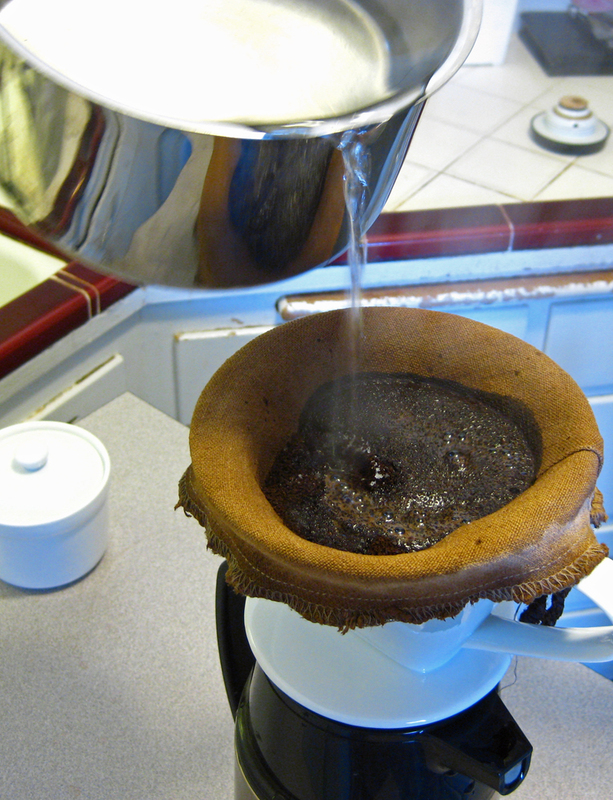 Move over french press and make room for the pour over method. We can see it now, the so-called “coffee aficionados”*, screaming at their screens telling us how insane we are. “How dare you title this blog post, ‘Best Cup of Coffee, Ever!” “Never freeze your coffee!” “Always get your beans fresh from a local source.” “Always grind seconds before brewing.” “Use a French Press!” “Starbucks** isn’t real coffee.” Blah, blah, blah. To the CAs, we say go ahead and spend a month’s worth of rent for that allegedly perfect cup of coffee. For the rest of us, just a little pinch of salt will do. For all those coffee drinkers who like to add milk and sugar to their coffee, but are trying to cut out the sugar, here’s another little tip: heat the milk first before adding it to your coffee. Heating the milk breaks down lactose and converts it to glucose (simple sugar) so the coffee tastes sweeter without any added sugar. You don’t need to buy an expensive espresso machine to steam the milk. A small saucepan on the stovetop will work just fine. *Air quotes are being used for sarcastic purposes. **We know there was no mention of Starbucks before, but many “coffee aficionados” look down on SB. We both happen to like SB and are grateful when we find one while traveling. Although, the McCafe in Madrid was nicer than SB. Just saying. « Older Post Chicken Involtini Part III: Wild Mushroom & Whisky	» Newer Post Hail Kale Caesar! Interesting! I never would have thought of salt. As I just recently learned about the pour-over brewing method and blogged about it last night, your post was timely and informative when I came across it this morning. Where does one find a reusable hemp coffee filter? I LOVE LOVE LOVE my little $40 Italian espresso maker that you use on the stove. I use Italian ground espresso and it makes a rocking’ cup of joe! Does the hemp filter affect the coffee flavor? Also, why does it improve with age?